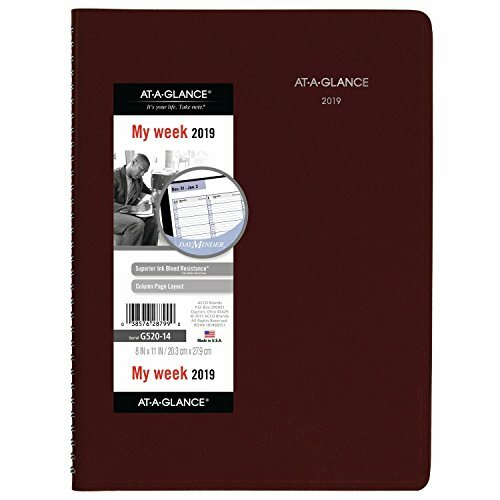 The At-A-Glance Day Minder weekly appointment book/planner lets you keep track of meetings, block time for errands and more. High-quality paper features superior ink bleed resistance. It covers 12 months from January - December with Julian dates. Its one week per two page spread features a Column-style layout with quarter-hourly appointment times. Appointment times run 7: 00 a.M. - 9: 45 p.M. Monday - Friday and 7: 00 a.M. - 6: 45 p.M. On Saturday to easily schedule appointments and designate time for daily tasks. Sunday space is condensed and Untimed for more flexibility. Past, current and two future month calendar blocks are shown on each weekly spread for reference. Appointment book is wire bound with Burgundy covers. 8" x 11" page size. 1 week per 2 page spread features a column-style layout with quarter-hourly appointment times. Appointment times run 7 a. M. -9: 45 p. M. Monday-Friday and 7 a. M. -6: 45 p. M. On Saturday.